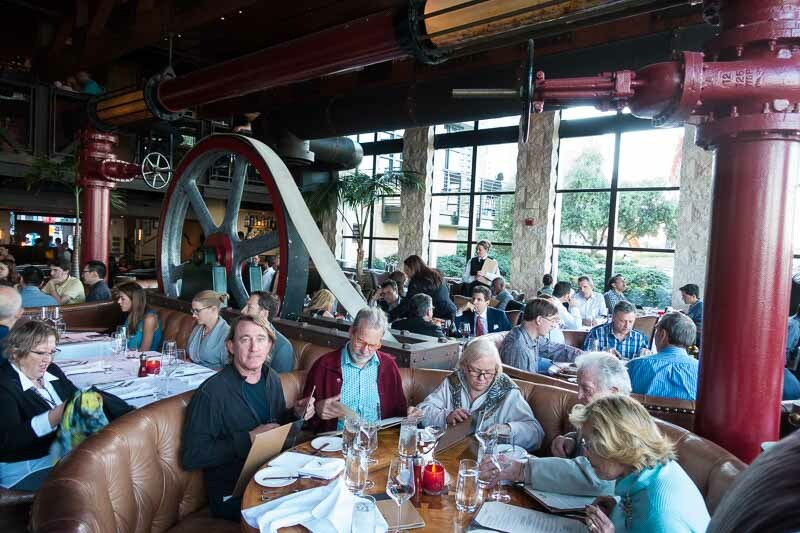 Out with friends in the City, we ended up at Epic Roasthouse, on the Embarcadero and almost underneath the Bay Bridge. It’s a stunning facility, part of the Kuleto restaurant group. Beautifully designed, right on the water, with dining both indoors and out. We were 30 minutes late for our reservation because it took 45 minutes and a felony U-turn to traverse the 1.5 miles from our previous stop, but we had called and our table was waiting for us. Reservations are clearly needed: this was a Thursday night and the place was packed. Harry had requested a table with a great view, and that’s what we had. A little later in the evening as the sun went down and the bridge lit up. The Epic Roasthouse is a place for meat. 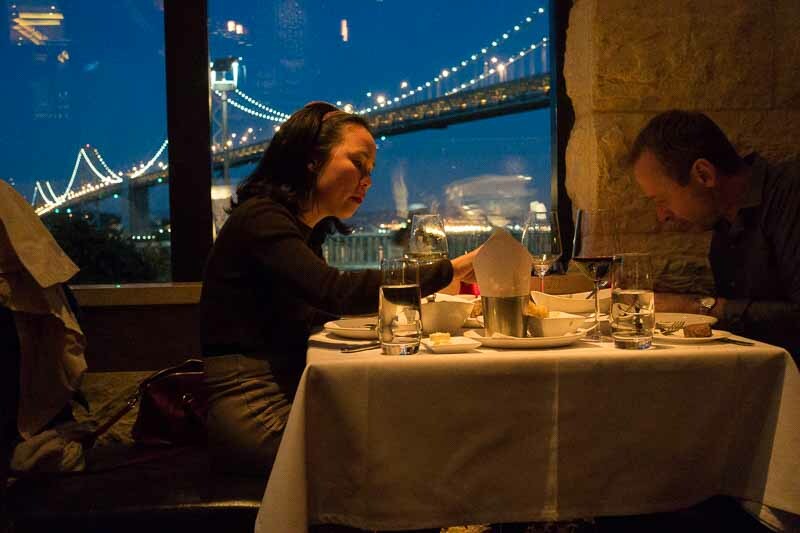 The menu is heavy on beef, and very heavy on dollars–it may be the most expensive restaurant I’ve ever seen that wasn’t a castle of haute cuisine like the French Laundry or Benu. At least I save money on wine. The iced tea is only $3.50. Restaurants these days have to do things to distinguish themselves beyond just having good food. Style, atmosphere, sound design, table furnishings, all contribute to the overall aura of the place. One little touch here was the salt. That’s right–salt. 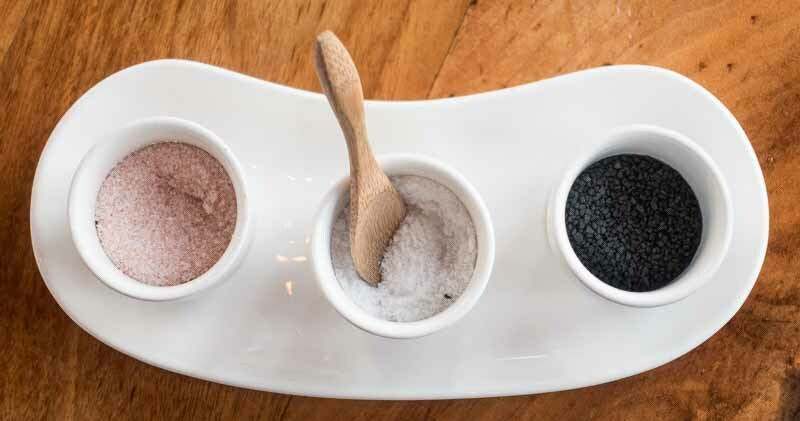 Three kinds of salt to perfect your meal. A triple salt cellar is something new. We all ended up having a salt tasting, to see if we could discern the difference, if any. The pink Himalayan salt on the left supposedly had more “minerality”, whatever that means. None of us could taste it. The Italian sea salt, center, had the finest granules, and a sharp, biting salt taste. The black Hawaiian volcanic salt has a milder taste and a lovely crunch from the larger crystals–it was everyone’s favorite. There really was a noticeable difference among the three varieties. I started with the asparagus salad. I got a very interesting and tasty plate, it just wasn’t what you think of as a salad. 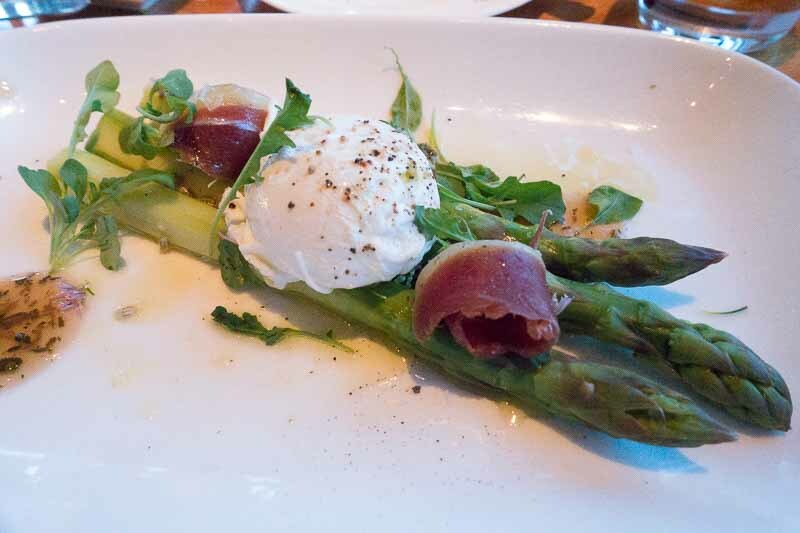 Asparagus, poached egg and duck prosciutto. Whatever it was, I liked it. The asparagus were very (perhaps too) crisp, the egg is always an interesting addition and the duck prosciutto was excellent. Then I made a big mistake. I ordered fish in a steakhouse. These people know how to broil a slab of cow, they know nothing about what to do with halibut. 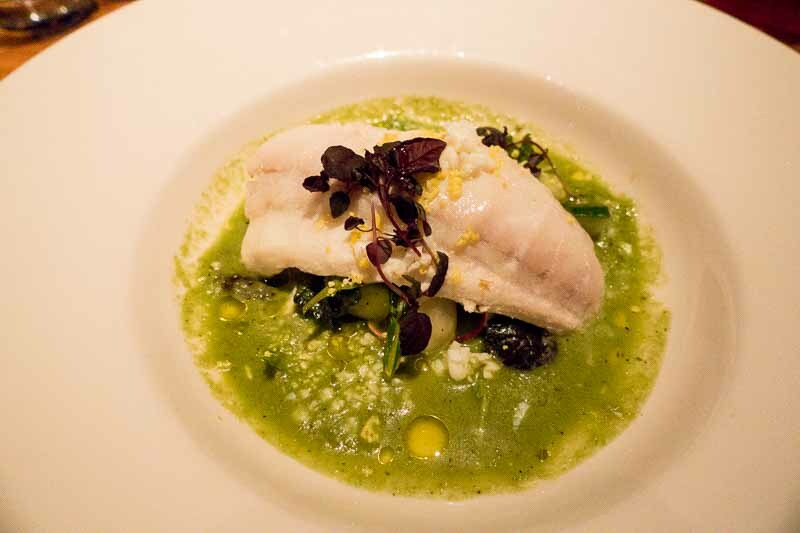 Halibut, with asparagus gazpacho. Not a winner. This, sadly, was the single worst piece of fish I’ve had in ages. Mealy, mushy, tasteless and unseasoned, floating in an “asparagus gazpacho” that was not only flat and uninteresting, but impossible to eat with a fork and not served with a spoon, a serious failure of plating. There was nothing interesting or desirable about this dish, and I didn’t begin to finish it. I was saved from starvation by Ruth, who had the best dish of the evening. This is what they consider a small prime rib. Gail had the braised short ribs, which were accompanied by a small portion of lobster. She was not thrilled with the meat, thinking it quite overdone and dry. To compensate, the lobster was underdone. Her meal was considerably sub-par, at least the universe is in balance. Look Ma!! Something else on the plate. 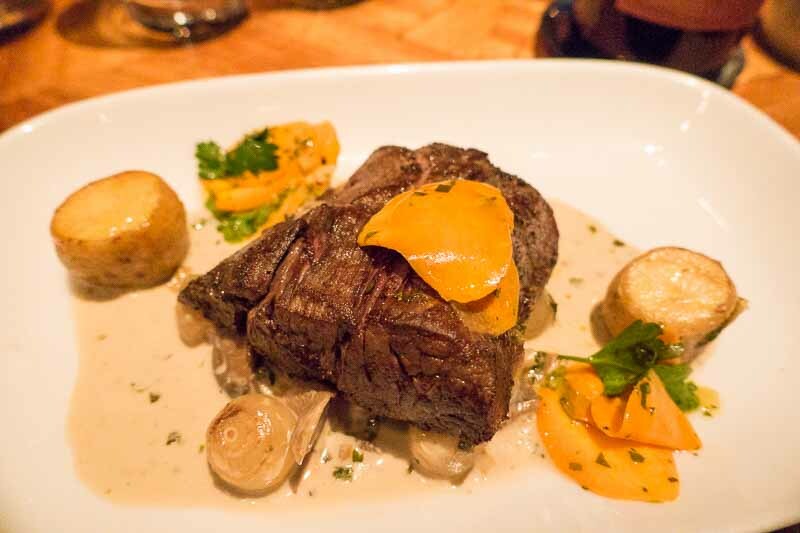 Plating and presentation are exceedingly important; how the food looks is almost as important as how it tastes. I thought this was a failure from that standpoint. 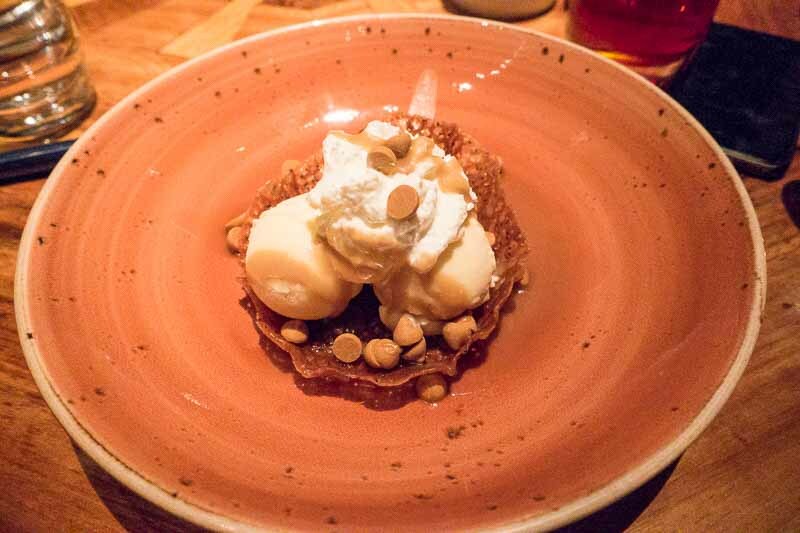 The huge dish made the small portions seem even smaller, the color did nothing to showcase the dessert. My three scoops of ice cream were smaller than a single scoop at Baskin Robbins, and no tastier. Mike and Harry shared the tart and clearly enjoyed it. The plating was good, too. Service was spotty. Some of it was excellent, some was quite poor. We sat with dirty dishes in front of us for almost 20 minutes before our plates were cleared. I recognize it can’t be easy serving everyone at a large round table, but it felt like they were just climbing over us to deliver the plates to Gail and Mike. 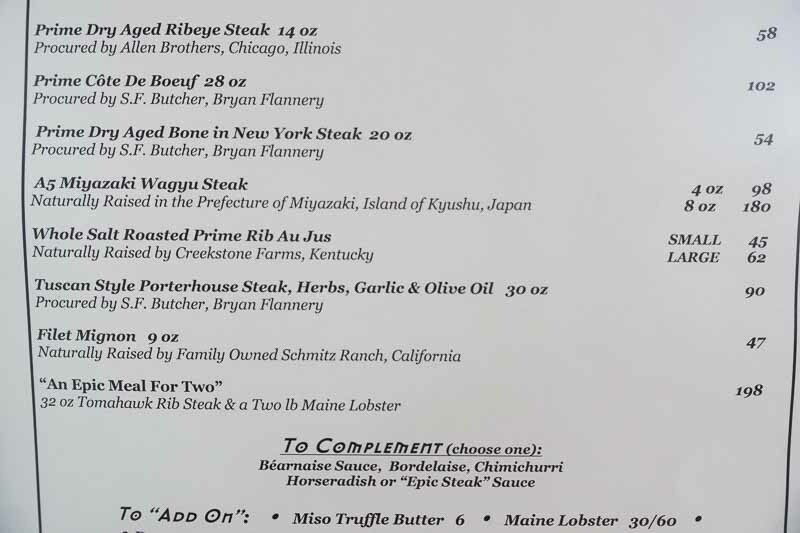 The bill for all of this was staggering, close to $100 per person and only 3 of us had wine. Plus $15 to ransom the car back from the valet. 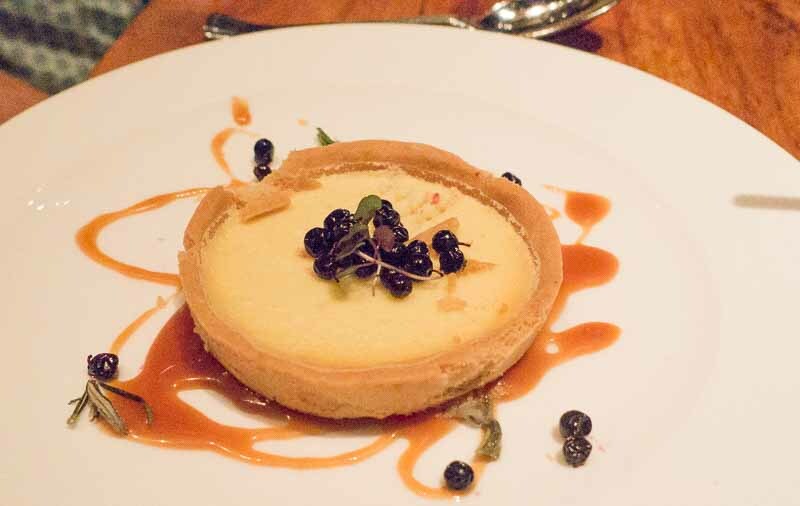 I’m pretty clearly not a fan of the Epic Roasthouse, but here’s my advice if you insist on going: make a reservation, bring lots of cash, don’t order fish, get a view table, don’t be in hurry, order the lemon tart. 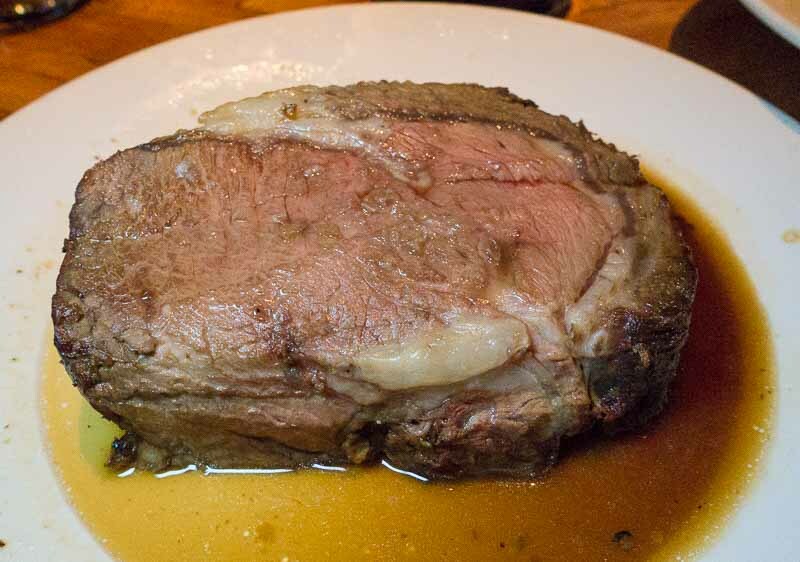 Or just go to the House of Prime Rib, it’s a better choice. when I started to read, I thought “why didn’t they go to the House of Prime Rib?” There is a somewhere in the Financial district -or used to be- that serves Argentinian beef, fyi. Did they have a “share/divide the plate” charge?? I think that large $102 beef would feed 4, for a reasonable price.